My family and I decided to take a mini vacation over Spring Break and headed to Monroe, LA. While my wife and daughter shopped at Kohl's, my son and I opted to seek out an LCS. Turns out, Jamie's Field of Dreams was nearby. 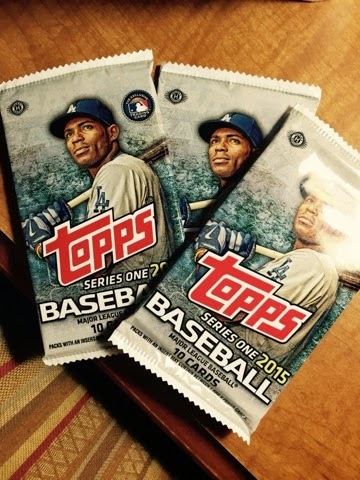 My son picked up a pack of Magic and I snagged 3 packs of Hobby 2014 for the PackADaily Circus. They had HTA for $12 and I wish I had snagged one of those, too. Ah well, maybe another time. UPDATE: Several players were in the draft that shouldn't have been. Ex: Don Mattingly, Jon Singleton, Lasorda, and Cole Hamels - I am entering names now and finding the dupes. Now that players are in ootp, mistakes should be reduced. Sorry about that! Hello, everyone! Welcome to another edition of PackADaily Circus Update! At some point, I will attempt to do these updates (or some updates, anyway) on Youtube or BlogRadio or something. Yeah, yeah, I know, something else I am adding different from last year. When will I stop? Probably never. haha! The first thing you probably notice are the team names. Some managers kept their names from last season and other decided to try something new. You may also notice that teams have been shifted around from last year's divisions. Some folks may be in the same division, others may not. There was no rhyme or reason to how things worked out. I want to give yet another H-U-G-E thank you to Josh D for making an update to the draft system. Now, I just copy the data from Google and the system will swap out email addresses for in-game team names! I cannot tell you how much time this whole process saves me compared to last season! Managers, I will have the next draft to you before Tuesday (March 24) morning! Hey everyone! I have *NOT* run the March 21 draft yet. I received my pre-release copy of OOTP, so I have been setting up our fantasy simulation while trying to remember just how I got EVERY historical player to show up in our system. It took me a while, but eventually I remembered how I did it last season. I will be emailing the four (4) folks that did not submit a draft this time to give them a very small window of opportunity. I know the system has some kinks, so I want to be sure we've all had a chance. The four are: ProwlingCat, Jafronius, BackstopCards, and SuperDuperMen. I have also asked JoshD for an add-on to the drafting program. I am waiting to see if my idea can be implemented before I run the draft. The good news, however, is that I am not waiting to start up another draft! There will another pre-season draft coming to managers very shortly. It will NO names we have used/seen before this season. That way, we can keep moving forward. As mentioned at the beginning of the PAD Circus 2015, I will be watching rosters, etc. We get 25 players for our active rosters to start things off. So, any managers without at least 25 players before the start of the season will have players randomly assigned to them. Actually, the system calls for a 40-man roster (25 are active), so we may end up with random players anyway. Not sure how the system will handle things until we get in there and try it out. As always, I appreciate everyone's help and feedback as we move forward! Oh, and as part of the OOTP pre-order, I will get a steam code for a copy of OOTP16. That will be given away during a special contest coming soon! That is open to ANYONE who reads along. Thanks for stopping by! I'll keep ya posted! First of all, we ran our first pre-season draft! The new Excel spreadsheet is working just as it should, and that is GREAT news for future drafts. Secondly, I made a mistake and included Mike Mussina in the draft and he was already claimed during the returning manager's initial picks. So, we got that squared away with little issue, so far as I can tell. It was a rookie mistake. Thirdly, AFTER the draft was over and I had assigned players to teams, I realized I had ALSO mistakenly included Reggie Jackson in the draft list. Dayf already has him and then it turned out that he ended up with him in the draft. Another rookie mistake. Because of the way I have to handle things until OOTP16 comes out, there was no good or easy way to handle this one. All I can do is apologize and move forward. Fourthly, we had three (3) players left over that did not get selected: BJ Boyd, Jordy Mercer, and Pedro Feliciano. They will be put into the next pre-season draft. Congrats to all the managers who participated! The next draft will be heading out soon!